This was a test flight of the SF slow descent balloon series intended for launch in the main 2004 HIBISCUS campaign. The aim of the flight was to investigate the ability of the balloon to sample TTL air during a slow descent after sunset. 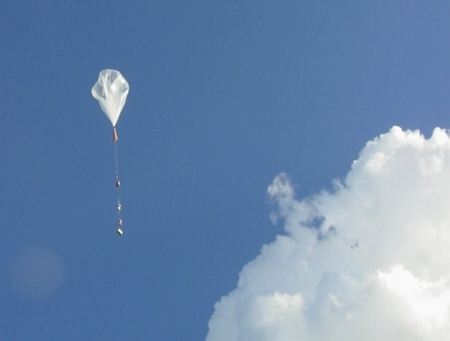 The SF2003 balloon was carrying two instruments for halocarbon measurement: the DIRAC in situ GC (University of Cambridge) measuring CFC-11, CH3CCl3 and CCl4, and the DESCARTES grab sampler (also University of Cambridge) measuring a wider range of halocarbons including CHCl3. Both halocarbon instruments performed well during the flight with DESCARTES collecting 15 samples and DIRAC taking around 50 airborne samples. Measurements of cloud properties were made by a micro-lidar instrument from ENEA & ISAC-CNR (Italy) which performed well. 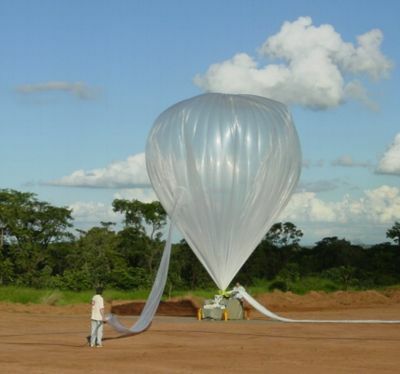 The balloon carried solid state ozone sensors (SSS-O3) and surface acoustic wave (H2O-SAW) sensors for water vapour measurement (University of Cambridge). A Vaisala radiosonde was also part of the payload and CNES GPS equipment provided balloon position data. The SF2003 balloon was launched from Bauru, Brazil (22.36 S, 49.02 W) at 20:32 UT (17:32 local time) on 19th February 2003. The launch was 1.5 hours before sunset and the balloon reached float at 21.8 km altitude 20 minutes before sunset, it then descended slowly during the night at about 0.5 to 1 ms-1, heading in a SW direction towards Assis. Cut down of the balloon was activated 2 hours and 20 minutes after reaching float by which time the balloon had descended to 18.8 km. The cut down was made earlier than desired due to safety reasons (balloon drifting towards lake areas). 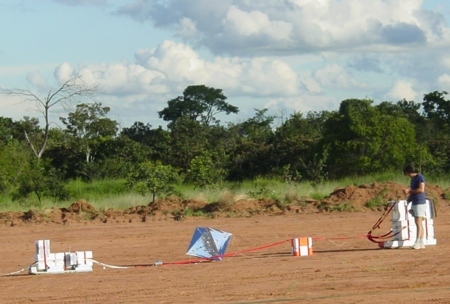 The payload landed about 30 km east of Assis, approximately 130 km from Bauru after a total flight time of 4 hours 34 minutes.